Welcome to Day 1 of the SugarPea Designs Holiday Release Week Sweet Peeks! Oh, you're going to love this release - so many great stamp sets and dies! 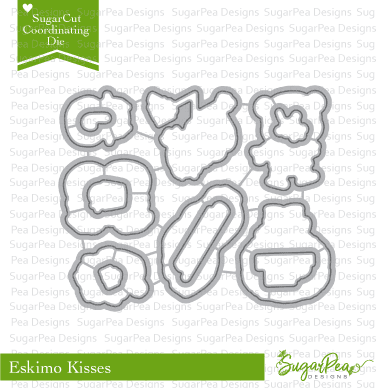 Up first is Eskimo Kisses, a set of adorable critters all dressed up for winter. And we've got some new basic dies - Stitched Borders I.
I used the ZigZag Stitched Borders I to create some masks and blended ink for my ocean and the straight Border to edge my focal panel. I stamped and coloured some icebergs - my little fishing penguin is towing along some gifts for his friends! For this card, I just masked and masked! It's easy to cut multiple masks by stamping on top of a small stack (max 4) of sticky notes and then cut them all at once. Then stamping a scene like this goes very quickly. Colouring took a little while, but my limited colour scheme helped with that. 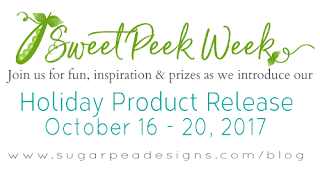 Be sure to check out the SugarPea blog for more details and chances to win! Love both cards Ardyth but you have won me with the second one, well worth the effort. Looks absolutely brilliant. Aaa the second card is way too cute! Awesome cards! Cute cards. I like the zig zag border on the first and the red hat on the second. Love them both Ardyth....especially that 2nd one! So clever! 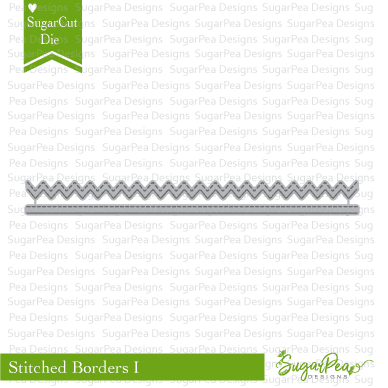 love the way you used that zig zag die! Super cute and creative! And the masking....LOVE it! Adorable cards! I LOVE all that masking. What a cool design. Both cards are as cute as can be, but the second really made me smile. I love it. So darn cute both of them! Wonderful cards. Love all that masking. Great cards, love the masking technique. Super cute cards!! I especially love the second one! You did a fabulous job with all of that masking!!! Love your cards! There's snow one like you is so adorable - must have taken forever to stamp everything out! Boy oh boy, so so cute! This set is the cutest. I love what you did with your masked card. Thanks for sharing! oh my gosh the second card is so stinkin cute. I love this. that's a lot of masking but oh so worth it. Both cards are sweet and awesome images. Gasp!!! I’m in love with your second card ❤️ That little guy is so cute on his own, but multiple times just makes me smile. Theses cards are too stinking cute! OMG!!! Your crowd of penguins is killing me... cutest card EVER. A lot of cuteness in this post ! Love both cards they are so unique ! I'm totally in admiration with your second one, lot of masking but OMG such a stunning result ! And this sentiment is so great ! Lovely products for this Day 1 ! Thanks so much for sharing and for inspiring ! Both of your cards are lovely. I especially love the colour palette you used. Your first card is just darling, but the 2nd one, I am squealing with glee; it is just too cute for words. I absolutely love the second card. It’s so fun and adorable. Ardyth, the card with the cute little penguin whose hat is too big is absolutely adorable! It's my favorite of the too, but they are both super cute. Thanks for sharing. Fabulous cards, I'll be casing these for Christmas! Your cards are gorgeous. Love them both! Love them both, smile at the cute ice floats and laughed out loud at the penguins. Adorable cards, I love the masking you did for your second card. These cards are so adorable ! Super cute cards. Love the penguin. What GREAT cards! The penguin towing the gifts is precious! The penguins covering the whole front of the card? Genius! Two great cards, creative use of the marshmallows!